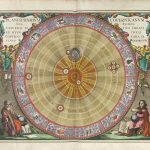 Research and innovation can help to address the grand societal challenges we are facing today: for instance, by enabling more efficient use of natural resources, reducing the environmental impacts of human activity, enabling clean and affordable energy and by fighting disease and promoting health and wellbeing. But the current drivers for research and innovation are not optimally geared towards addressing these challenges. To unlock the full potential of the research and innovation system, we have to start targeting these challenges much more directly. DPF works at the interface of science and society. We design novel interdisciplinary interactions between researchers, producers, policy makers and civil society, creating new connections to drive research and innovation towards social value creation. From December 2017 – March 2018, DPF has carried out a short-term research project commissioned by The National Institute for Public Health and the Environment (RIVM) on the history of green chemistry. The final report Learning from green chemistry for Safe-by-Design (in Dutch) presents the research findings, and provides suggestions to strengthen the role of Safe-by-Design in research and innovation policy. DPF is a partner in the EU-funded GoNano project. GoNano enables co-creation between citizens, civil society organisations, industry, researchers and policy makers across Europe to align future nanotechnologies with societal needs and concerns. GoNano aims to demonstrate how researchers can work with publics and professional stakeholders to create novel suggestions for future nanotechnology products. The project started in September 2017 and will run for three years. DPF leads the co-creation activities with professional stakeholders and supports project communication. We will also contribute to the review of the state of the art in co-creation, training activities and policy outreach. For more information, see: gonano-project.eu. This presentation held at EuroNanoForum 2017, 21 June 2017 in Valletta, Malta argues that the grand societal challenges have to take centre stage in European research policy to unlock the full potential of the research and innovation system. See: Reversing the order of innovation. 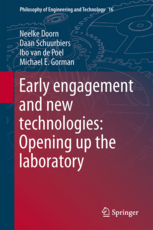 The book ‘Early engagement and new technologies: opening up the laboratory‘, edited by Neelke Doorn, Daan Schuurbiers, Ibo van de Poel and Michael E. Gorman, explores current engagement approaches including technology assessment, value-sensitive design, and socio-technical integration research. This thesis was the starting point for DPF in 2010. 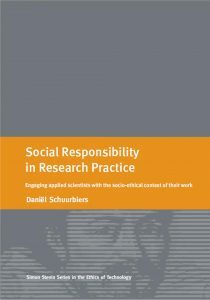 It explores the opportunities and constraints for realising a broadened conception of social responsibility in daily research practice by way of three empirical interventions. See: Social Responsibility in Research Practice.